I know you may be tiring of all my DIY ornaments but please suffer through one more with me. I just can’t seem to get enough of them lately and when I finish one – or sometimes while working on one – thoughts of how I will decorate the next one are already running through my mind. They’re so easy to play with and you can fit them to any theme or event. So here’s the steps to how I created this precious little hanging. 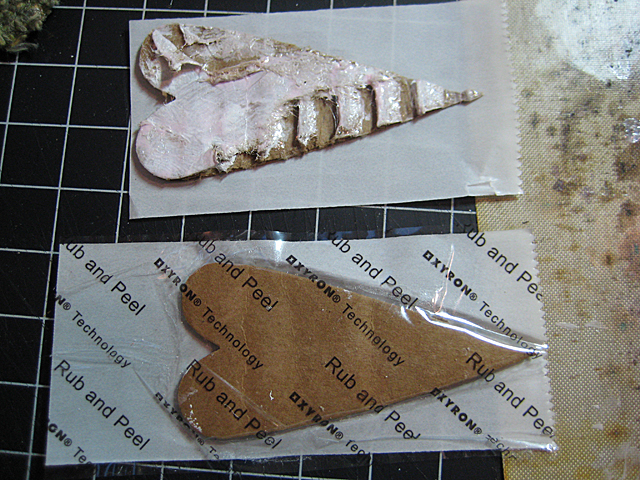 I cut two of the hearts from corrugated cardboard, ran them through my Xyron 1.5″ Create-a-Sticker. I left the hearts on the Xyron backing and spritzed them with water and roughed them up a bit before painting them with G&P Pink Rose 3D Enamel Gel. While the Gel is still wet I sprinkled them with Art Glitter Mimosa #102 Ultrafine Transparent. I love the way this glitter glistens as the globe turns and moves – it sparkles in different colors. Really cool. The rims of the ornament are also painted with the Piccolo 3D Enamel Gel and the outer rims sprinkled with the same Mimosa glitter. 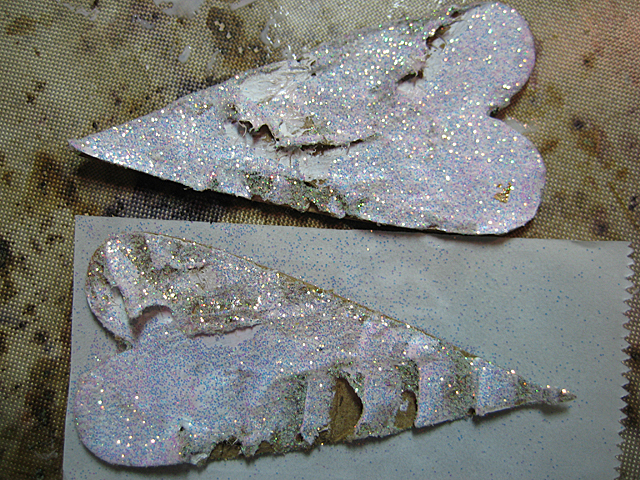 I coated the fairy wings with a clear layer of Glastique so the natural color of the bookboard shines through. Once all the pieces are dry the assembly begins. 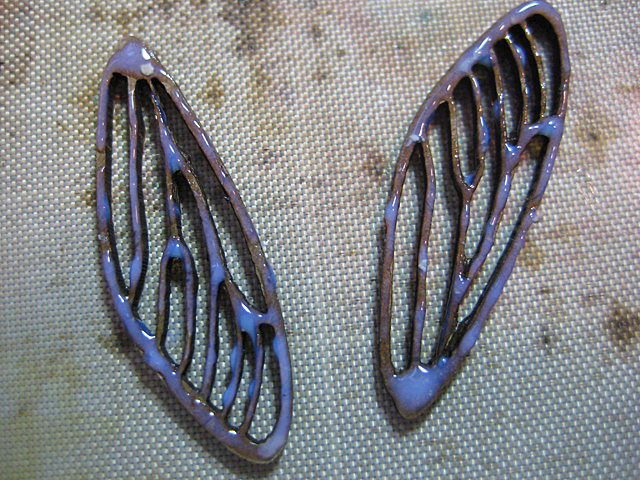 I laid a strand of wire on the backside of one of the hearts and used Designer Dries Clear to adhere the wings to the same backside. The same Designer Dries Clear is used to adhere the hearts back-to-back. The printed, cut out and inked words and gems are also adhere with the Designer Dries Clear. I assembled the Globecraft DIY Ornament following the directions that came with it. Before adhering the top globe and rim to the bottom, the wired hearts are laid across the center of the globe. Designer Dries Clear is used to adhere the top half to the bottom half and I use clip clothespins to hold it together till the glue sets. 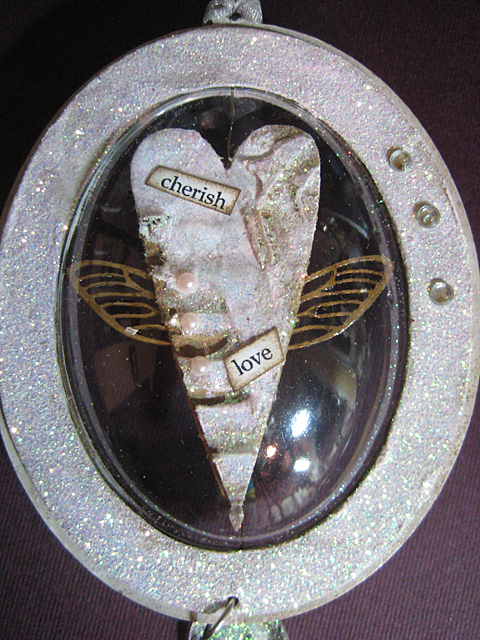 One side of the heart says ‘wish’ and ‘dream,’ the other side says ‘cherish’ and ‘love.’ When the light catches this it just sparkles and makes me smile. 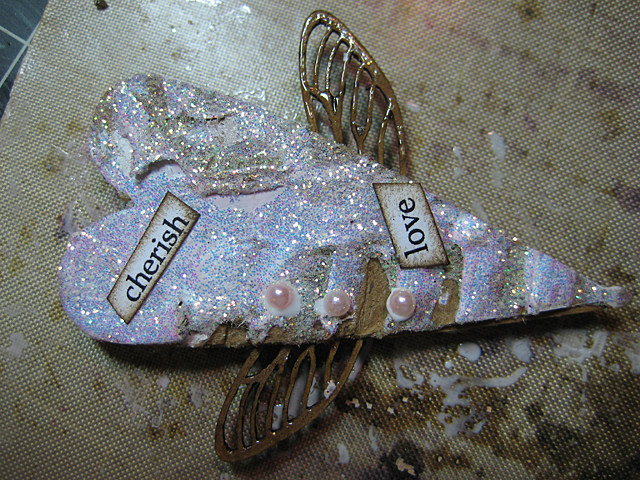 Visit the Art Glitter blog to see another project I created recently with their glittery products! I love your ornaments! This one is my favorite. I also loved your project over at Art Glitter! Those butterflies were just perfect! I never get tired of seeing them! Thank you, Candy! I never tire of making them. They are very cool wings! What a great project! It’s so glittery…perfect! Lovely project Linda. TFS how you made this.